Art direction, web design, and packaging created for Skylink International, a leading aerospace engineering firm. My task was to create a brand identity that captured the essence of aerospace engineering. The final result was a new logo, 3 package designs, merchandise, and a website. I started by conducting research on aerospace engineering, a topic which I knew nothing about. During my research, I found re-occurring words like ‘technical,’ ‘precision,’ and ‘dynamic.’ These keywords stuck with me and inspired the look of the brand. When creating the logo, I knew that it should resemble the heart of Jetfuel; precise and dynamic. I aimed to create a simple and iconic mark that set Jetfuel apart from other coffee companies. Rather than using classic coffee graphic motifs such as beans and mugs, my goal was to deliver a more elevated and polished visual experience. The finished logo is a simple, compact, and iconic solution. By replacing an ‘E’ with the airplane symbol, I was able to keep the logo minimal, avoiding any graphic redundancies. The stand alone symbol is also ultra scaleable, providing a memorable image even at tiny sizes. During my typeface exploration, I searched for a san serif that would contribute to Jetfuel’s identity of precision. I chose DIN for its sleek and precise look. The typeface is powerful and nimble, even when thrown in front of the detailed blueprint illustrations on Jetfuel’s packaging. With many weights and options, DIN allowed Jetfuel to develop into a brand with impactful typographic solutions. Example of type lockup for homepage banner. Example of type lockup for product pages. When choosing an illustration style, I referred back to my initial research notes, where I was captivated by the insanely detailed process of engineering an airplane. 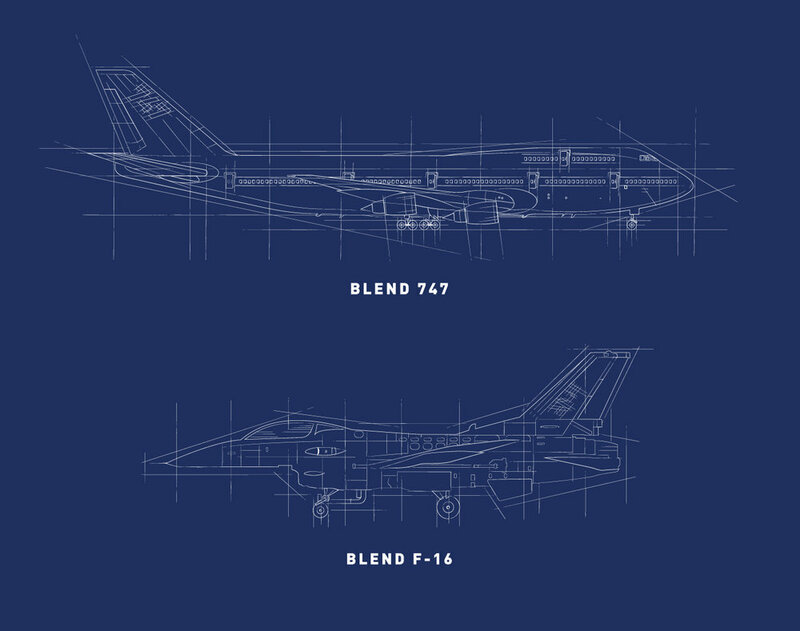 I created very detailed blueprint illustrations that enhanced Jetfuel’s identity.